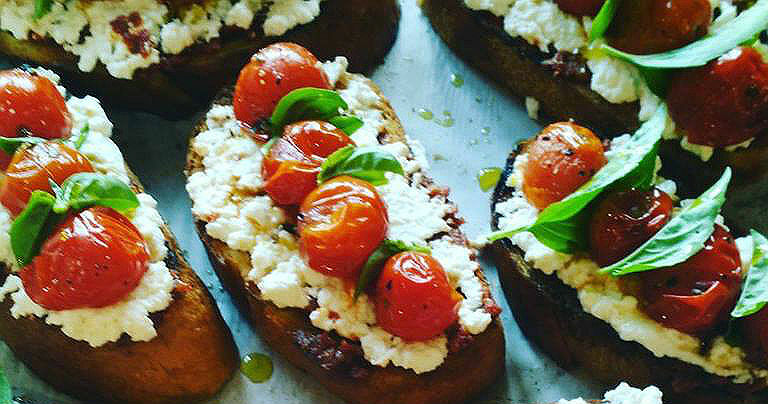 Is there anyone who doesn’t like bruschetta? Seriously. People have had a fondness of this antipasto since ancient Rome. And no. Bruschetta isn’t the tomato based topping. The name comes from the Tuscan dialect, “bruscare,” which means, “to roast over coals.” When it came time for harvesting and pressing, olive growers would taste the first oil of the season on toasted bread. Read the recipe below for a timeless classic that’s a great appetizer or hors d’oeuvre any occasion. Preheat your oven (or grill) to 425F. In a medium sized bowl, whisk the ricotta with 1 teaspoon salt. Throw in the cherry tomatoes with 1/4 cup of Arbequina Olive Oil , a teaspoon of salt, and pepper to your preference. Roast the cherry tomatoes in a cast iron skillet for 15 minutes until blistered and fragrant. Set aside to cool. Slice the bread into 1″ thick slices, drizzle the slices with 1/4 cup of Arbequina Olive Oil, and grill over high heat, for about 5 minutes on each side, or until golden. Rub each side of the warm bread with garlic cloves and set aside. In a food processor or blender, add the sundried tomatoes, 1/2 cup basil, 1 garlic clove, 1/4 cup Tuscan Herb Olive Oil or Roasted Garlic Olive Oil and process to a paste consistency. Spread 1 tablespoon sundried tomato pesto over over one side of the each slice of grilled bread. Top by spreading 1 tablespoon of ricotta. Then place 2 or 3 cherry roasted cherry tomatoes over the ricotta layer, and then add a basil leaf between each tomato (if you’re feeling fancy). Otherwise just sprinkle the bruschetta with torn basil leaves. Finish each bruschetta with additional sea salt, fresh ground pepper, and a drizzle of Arbequina Olive Oil or some Traditional 18 Balsamic. Serve immediately. The olive oil you use is the key to this recipe. Afterall, bruschetta was made to test olive oil. That’s why when it comes to this dish, you always need to go with the good stuff. It brings cohesion to the bread, the cherry tomatoes, the ricotta, and the basil. So only the finest bottle of extra virgin can give a proper nod to long tradition of olive growing. At Kalamazoo Olive Company, our Arbequina Olive Oil is a premium, unflavored extra virgin oil coming from the May 2017 harvest at the Alonso Estate in Chile. Stop by our shop to check out this oil, along with many quality ingredients.